﻿KongFeng's resurrection of the Game Boy, with backlit screen, British spelling and slightly wonky aspect ratio! The original Gameboy Color is a system I have fond memories of. Unlike its successor, the Game Boy Advance, I never considered its screen to be particularly difficult to see. Despite its lack of internal lighting for the screen I never had much of a problem bouncing through Warioland 2 or resolving to finally wake the Windfish in Link’s Awakening, only to get bored, quit after the sixth dungeon and end up starting all over again the following year. ​The only thing that was ever a bother was trying to play the thing in the dark. When the backwardly compatible GBA SP came out, however with its flashy front-lit screen, later backlit in the AGS-101 model, I started seeing Game Boy Color games for what they should have been all along. Colors suddenly popped and details that had fallen flat emerged with crystal clarity. There was only one problem. Playing games designed for the Game Boy Color just didn’t feel right on the SP. Because of the different screen aspect ratio, the choice between a smaller picture with vertical black borders or, worse, having it horribly stretched into widescreen was jarring. Also the way the cartridge stuck out of the bottom just made the whole thing feel…wrong. Despite now having the option of fully lit gaming, I still went back to my Color model for that all important ergonomic satisfaction. Look at this! Look at it! Only a monster would do this to poor Tetris! As the years went on the price of a second hand backlit SP AGS-101 model slowly crept up. I fact, with the current retro gaming madness that has swept auction sites like Ebay over the past few years, even an original Gameboy Color now carries a fine price. We’ve also reached a point where anything non-backlit has become something in need of fixing. Front-light mods are now crazily common for the Gameboy Color, crazily expensive too if you wanted to buy one custom made from the likes of Rose Coloured Gaming. Unfortunately the game Boy Color can only ever be front-lit, not backlit. Front lighting,while it too was once considered wonderful, is also now looked down on as second best to a back-lit unit as it causes colour washout to occur and lacks the crisp pureness of the latter option. Enter Hong Kong based manufacturer KongFeng. Promising to bring an inexpensive solution to all of our Gameboy related problems with The GB Boy Colour. ​Hey look fellow Brits, they even fixed the spelling! 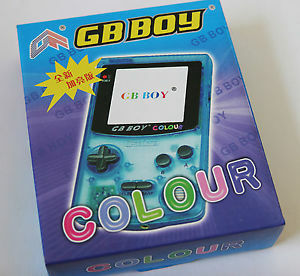 The GB Boy Colour box art. Straight out of the box the GB Boy looks and feels the part. It’s D-pad (despite the oddly rounded appearance) and buttons feel good under the thumbs, with Select and Start now solid plastic as opposed to those weird rubbery ones that Nintendo used to have a thing for. There are six colours to choose from, matte yellow, green and blue or crystal blue green and purple. The system still powers up with two regular AA batteries and externally all of the ports present on the original Nintendo device are present and correct except one. You’ll still find your AC adaptor out and stereo headphone jack at the bottom (another big advantage of the Gameboy Colour over the GBA was the ability to use headphones without a special adaptor.) Meanwhile an external connector port for linking machines up for two player games still resides on the left hand side next to the volume slider, although oddly it is the one designed for the GBA SP. This means that while two GB Boy Colour systems will be able to link using this, you won’t be able to link the GB Boy Colour to your original Game Boy Color. Onto what’s missing from this budget model. While you’ll still see the familiar black square on top of the device,this is aesthetic only, as the crystal models reveal no wireless transfer transmitter housed underneath. Given just how slow this feature was on the original GBC in comparison to using a connection lead, it really is no great loss. Turning on the system brings an immediate contradiction of feelings as once the ‘GB Boy’ logo (replacing the original Nintendo logo) scrolls up and stops with the familiar sound of a coin being collected you’ll either face one of two possibilities. Presuming you haven’t yet inserted a cartridge you’ll be presented with a list of 188 pre-loaded games. While a little further inspection reveals these to be the same 66 titles repeated 3 times over it was still a pleasant surprise for those of us who adopted the system when this was not a regularly advertised feature (since the re-release of the console a sticker now advertises this on the box). This is the first thing you'll see if you boot up a system without a cartridge. While there are actually only 66 games many are classics. All of the games are original Gameboy titles, not color games but all are ‘colourised’ by the GB Boy as they would have been on Nintendo’s original device and, yes, you can still change the colour schemes by holding down the same button combos you would have done on the original GBC. Now onto one of the drawbacks that the eagle eyed will have noticed by this point. While the sound is excellent, just as crisp and clear as on the original hardware, there is something wrong with the display: The screen aspect ratio is just not as it was. The new screen is a little wider horizontally and shorter vertically than it was on the original GBC and this has split a lot of hairs online. Some people, myself included see no real issue here, everything is a little more squashed than it was originally but it’s also closer to the size of the original sprites than the smaller display you get on a GBA SP. This is something that will bother some people more than others. Moving onto compatibility, until recently I had used my GB Boy Color for over two years with no compatibility issues…until recently, that regular urge to go back to Kolohint island and finally wake the Windfish came around again. I noticed something strange. If I mashed the buttons and dpad too quickly, Link would whirl around and disappear! The sprite would vanish and only reappear if I exited a dungeon. I tried this multiple times and found it happened each time. Concerned I busted out a newly acquired GB Boy and tried the cart on that one. The same issue occurred. I can only conclude then that this is a peculiar (if avoidable) glitch involving Link’s Awakening and the GB Boy hardware. Sadly, experience tells me that compatibility issues are rarely limited to a single game, although at the time of writing Link’s Awakening is the only Game Boy game that I have had issue with using the GB Boy Colour which has been my Gameboy of choice for two years now. Link's Awakening DX: The one Game Boy game that we have experienced glitching with in conjunction with the GB Boy Colour. Just don't mash the d-pad and you'll be okay! Recently a couple of strange things happened involving the GB Boy Colour. ​Firstly, Kong Feng made the absurd decision to begin selling an SP themed version of the GB Boy, minus the built in games and with all the ergonomic issues mentioned at the outset of this review. Secondly, the GB Boy Colour classic model vanished from the marketplace. Not a single one could be sourced anywhere on the internet. Second-hand systems began trading for insane prices on Amazon and Ebay. Then, after almost six months of no activity a re-birth occurred. Seemingly having come to their senses Kong Feng returned to the original model and a brand new batch was released. The system is now widely and cheaply available once again over at Ali-express from a dozen or more sellers. Quite what shenanigans went on over this six month window are unclear. Legal problems? Trying to shift the unpopular SP model? A deliberate attempt at price fixing? It seems destined to remain a mystery. Me, I bought a second system just in case and now, with extreme precision and being very careful not to mash the buttons, I’m off to finally wake the Wind Fish. Above: A stupid, ugly thing that misunderstands every reason people fell in love with KongFeng's original product. The GB Boy Colour, despite a few minor quibbles over its aspect ratio and a couple of missing or altered hardware features, remains one of the best value alternatives to Nintendo’s original classic. The addition of a beautiful backlit screen, 99% compatibility with Gameboy and Gameboy color carts and the addition of 66 built in classic Gameboy titles makes it not just a nice little nostalgia burst but an inexpensive and practical solution to playing your Gameboy games in darker conditions with the comfortable ergonomics you remember.